Vince Friese took the 450SX main event holeshot over all of the past champions and whole slew of other solid riders. Friese was able to hold on to the lead for a half lap before Villopoto made a pass on him following the split lane section. Chad Reed, Justin Brayton, Ryan Dungey, Wil Hahn, James Stewart and Justin Barcia were all also able to advance past Friese as the field fought for positions in the opening laps. Out of the top-ten riders, Stewart did the most work in the first half of the race. He made rather quick work of Hahn before setting his sites on Dungey. 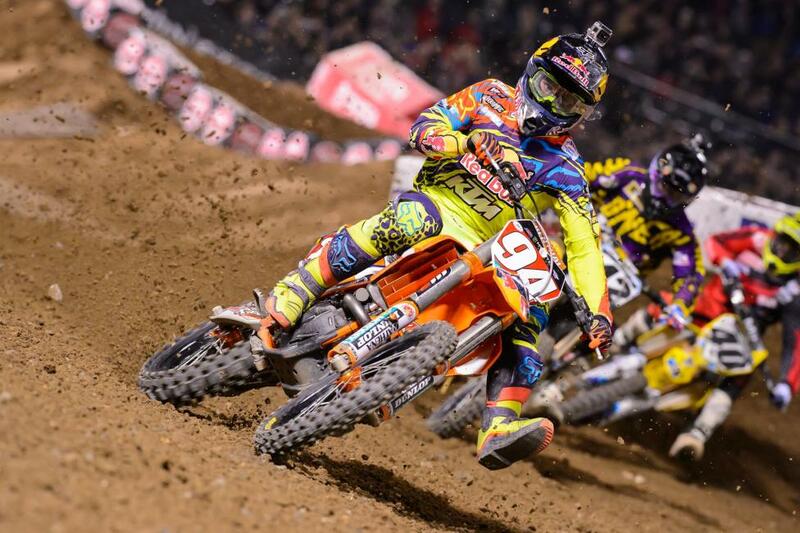 Stewart was all over Dungey for a half lap before making the pass into fourth. 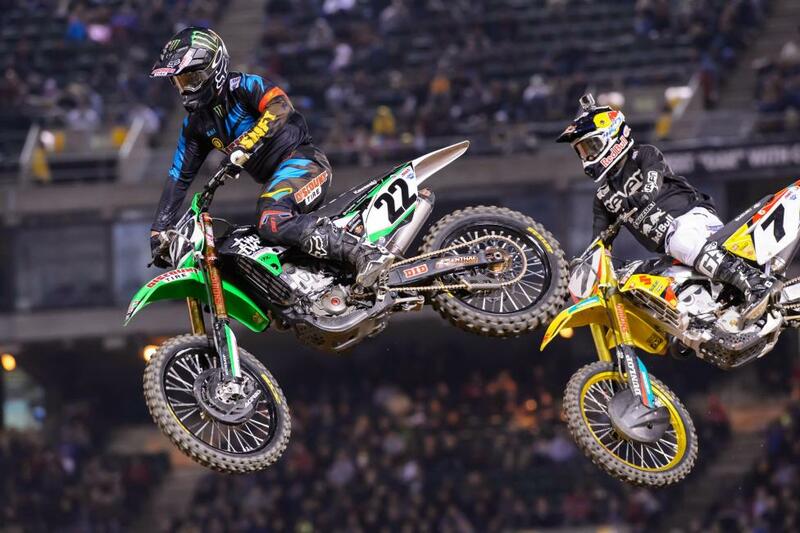 Villopoto and Reed had opened up a comfortable gap by this point. Stewart then took on Brayton for third. He made the block pass on Brayton, which opened up the door for Dungey as well. Dungey got Brayton just a couple corners later. 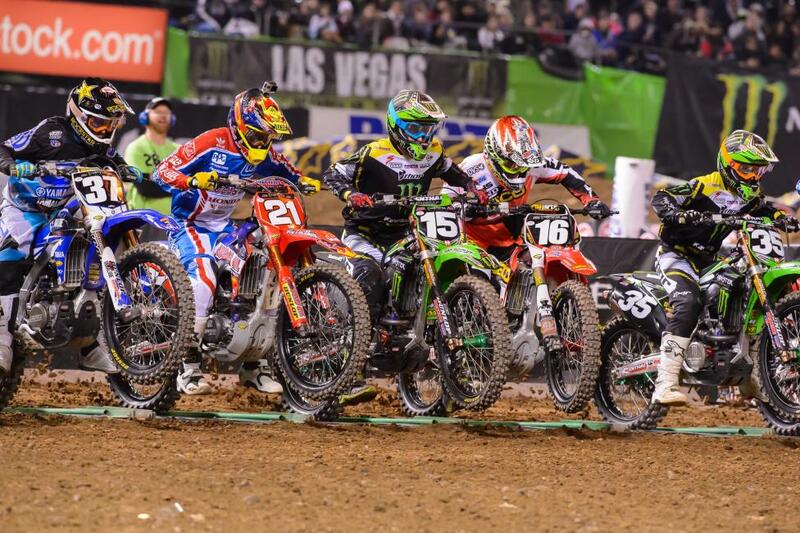 Reed’s comfortable gap over third place quickly diminished when Stewart began to do a quad in the rhythm section following the start straight. Dungey followed suit and started doing the quad as well, but had to stretch it out and would come up short every now and then. After closing the gap on Reed through multiple laps, Stewart put the pass on Reed for second place just a couple corners after the quad. 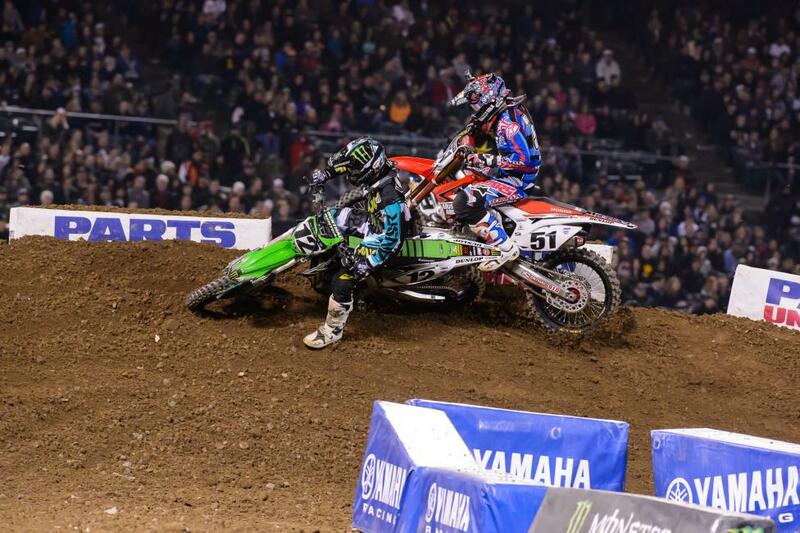 Dungey closed up on Reed as well, but was unable to get close enough to make a move for the last spot on the podium. Villopoto continued to ride away unchallenged for his second win of the season, followed by Stewart in second and Reed in third. In the 250SX main event, Dean Wilson fired out of the gate first , but his Monster Energy/Pro Circuit Kawasaki teammate Justin Hill made an inside pass for the lead in the following corner. Jason Anderson had a decent start and was able to move quickly through the pack and up to second place in the opening laps. Red-plate holder Cole Seely battled with Osborne for fourth while the top three riders began to separate themselves from the rest of the field. Anderson put his flat-track skills to use to put a pass on Hill through the inside of the start-straight corner for the lead, but that pass only lasted for one lane. Hill was set up for the inside line going into the following corner and rode Anderson high to retake the lead, also allowing Wilson to move into second. Wilson then overtook Hill with a block pass in the corner following the whoops. Anderson passed Hill back in the same corner Hill block passed him one lap earlier to take back second. Wilson had quite a gap over Anderson with five laps to go, but Anderson was able to whittle away at the gap through lapped traffic. As Anderson neared Wilson, Wilson suddenly and unexpectedly rolled the first triple on the track and in turn handed the lead over to Anderson. It was too late for Wilson to make a late-race charge and Anderson went on to take his third win of the season. Wilson took second and Hill took third for his first podium appearance. Wilson later stated on the podium that his bike died and caused him to roll the triple. 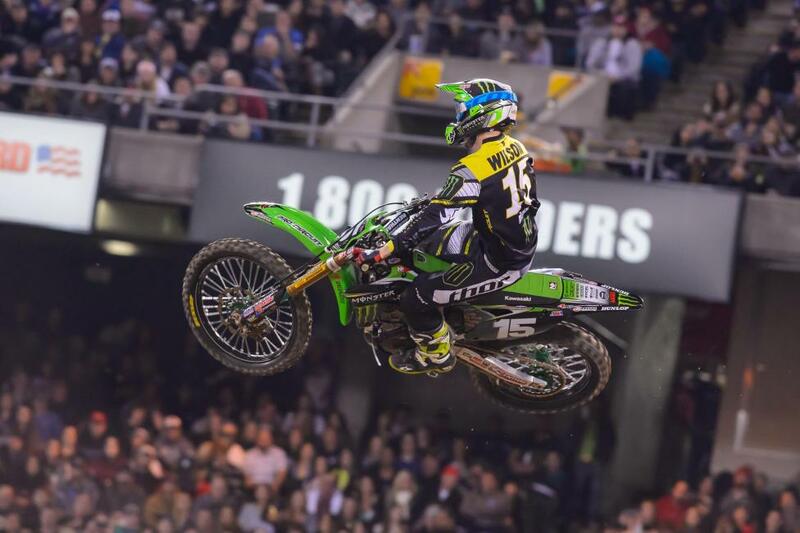 Coming into the Oakland round of Monster Energy Supercross, the buzz was all about the possibility of having four different 450SX winners in four different rounds. And while that didn't end up panning out, the night's action was still jammed with great racing. Here's what went down in Northern California at the fourth race of the season. 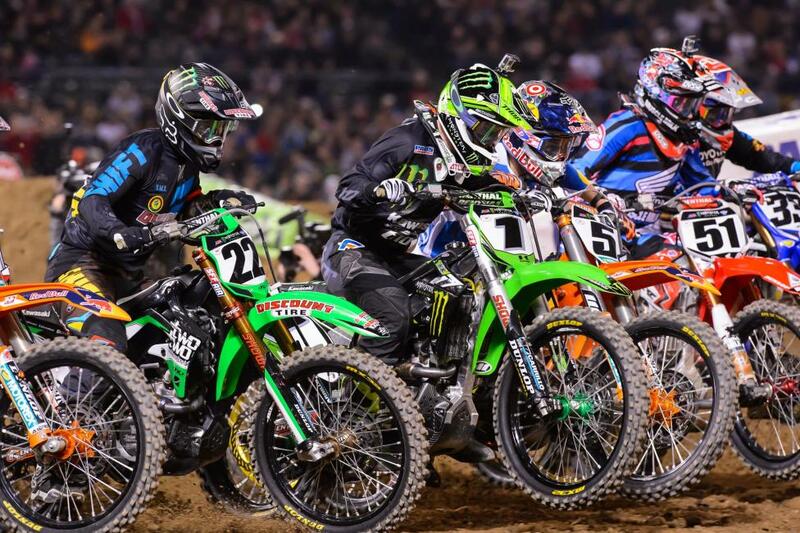 Ryan Villopoto didn't holeshot the 450SX main event, but it didn't take him long to move to the front after starting in third behind Vince Friese and Justin Brayton. Vince Friese was officially recorded as taking the 450SX holeshot, but he went backward pretty quickly after that, finishing the race in fourteenth. Justin Brayton continued his string of excellent results by taking fifth, but he didn't quite have the same speed as last week when he came back on Villopoto for a heat race win. After the race he said he was having a hard time with the dragon's backs all night. Roczen had a so-so night, finishing sixth, and was never a factor in the battle for podium positions. 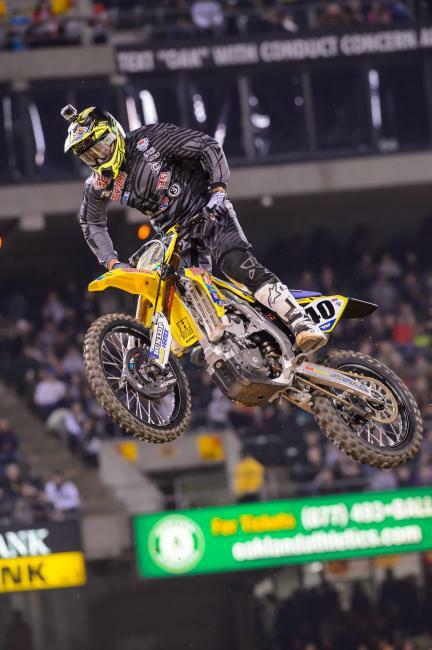 Weston Peick ran as high as seventh, but DNF'd with what appeared to be a mechanical failure. 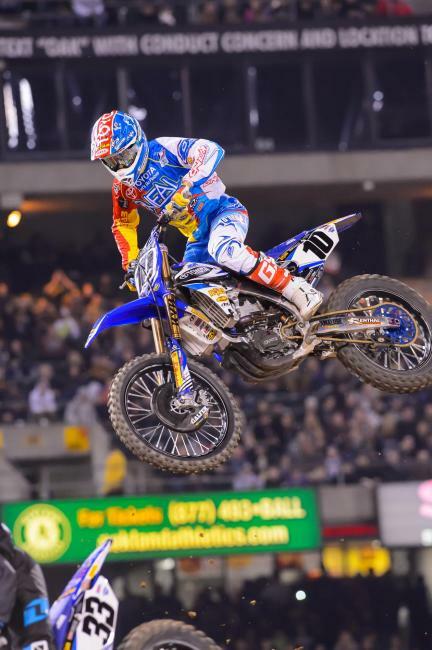 The crowd got to see another battle between rivals Chad Reed and James Stewart, but instead of racing for the win, they were battling over second place, where Stewart would eventually finish. 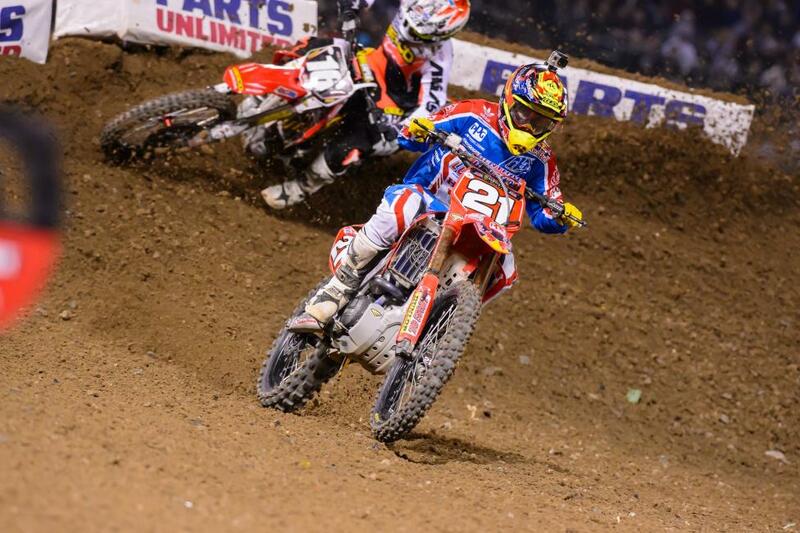 Justin Barcia had another night he'd likely rather forget. A bad start and a crash in the dragon's back resulted in a seventh place for Barcia. After finishing the first lap in sixth place, Stewart was able to work his way up through the pack, but second place was as high as he would go. He was taking a little bit of time out of Villopoto's lead at the end, but Villopoto had a big lead and was in management mode. RV would win the race, taking the points lead in the process. 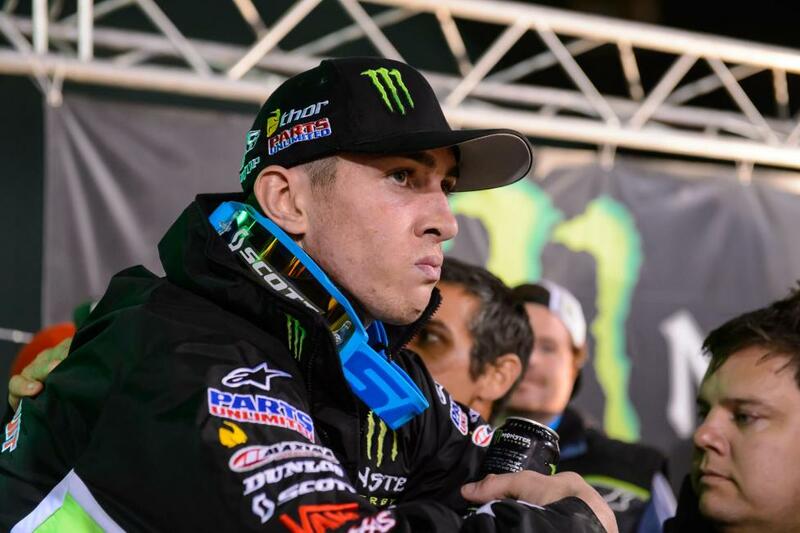 Dean Wilson nabbed the holeshot in the 250SX main event, but teammate Justin Hill ran him high in a corner, causing him to miss a triple and nearly get landed on. Ironically, when Wilson retook the lead a few laps later, he used the same move that Hill did on him in the same turn. 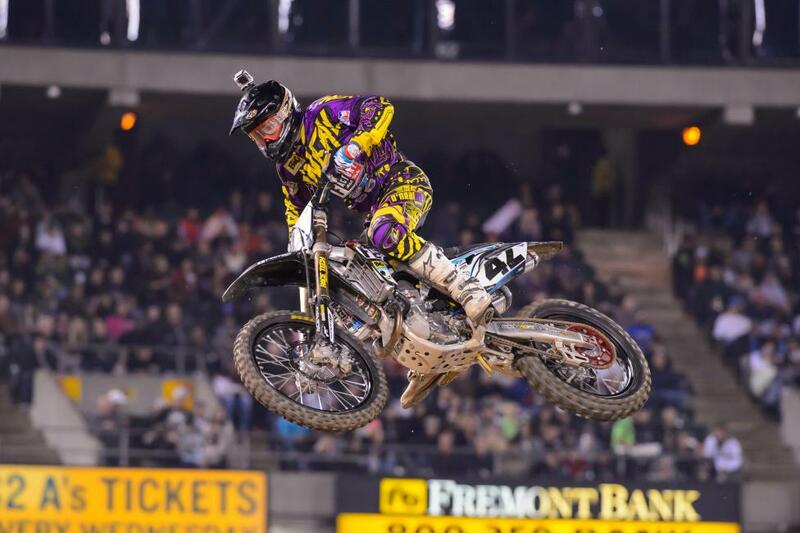 Hill showed some serious speed in Oakland, leading six of the 250SX main event's fifteen laps. He would eventually take third on the night, scoring his first ever podium as a pro. Seely recorded a few laps that were pretty fast in the main, but he just didn't seem like he was on the same level that he was on at the first three rounds of the season. After going back and forth with Zach Osborne he took fourth and now sits second to Jason Anderson by six points. Wilson was on point tonight. After taking the lead he held it for eight laps--a vast improvement from his performance at the first three rounds. Unfortunately he ran into some bad luck on the final lap (in a his post-race interview Wilson said his bike momentarily cut out on him) that would prevent him from making a triple. Anderson was there to capitalize and seize yet another win on the final lap of the race. 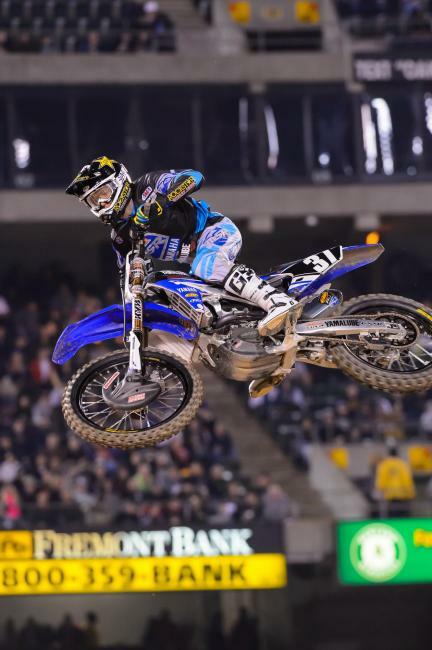 Cooper Webb wasn't able to repeat his podium performance from last week. In a move that he would later take the blame for, Webb tried a move on Malcolm Stewart that left them both on the ground. 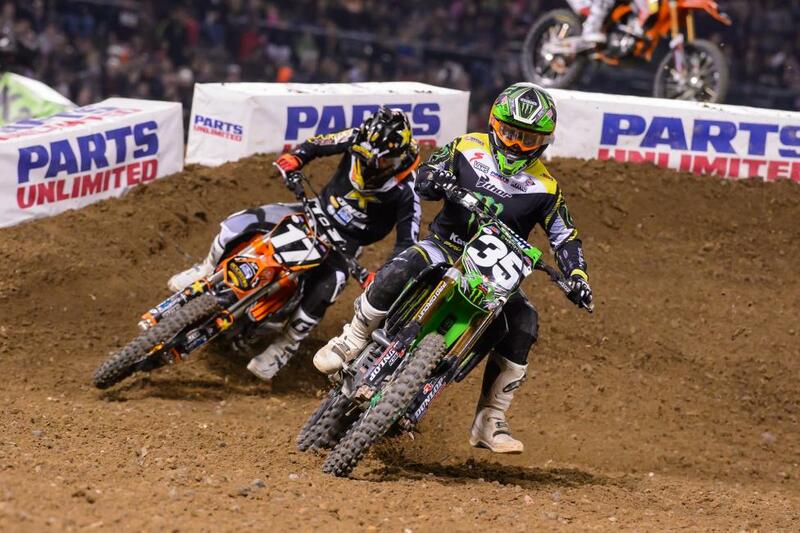 Webb took ninth, while Stewart, whose rear brake pedal was torn off in the incident, finished in sixteenth. After leading for just six of the season's first sixty laps, Anderson holds a six point lead going into A3.